During this past weekend in Norfolk a friend showed us some movies that I haven't seen yet. Drive is excellent! David Cronenberg's 1983 horror entry Videodrome... hmmmm, interesting. Saw some foreshadowing of our Internet culture there. And for my own part I brought along Hobo With A Shotgun. It's The Tree of Life that I haven't been able to stop thinking about for the past 48 hours. It's up for Best Picture during the Oscars this coming Sunday night (along with The Artist - a movie I've seen twice in theaters, this is the second Best Picture nominee this year that I've caught). And I can understand why. It's jaw-droppingly beautiful to oggle and admire. Writer/director Terrence Malick was able to woo Douglas Trumbull himself to come out of retirement to do the visuals for The Tree of Life. Trumbull was the genius who pulled off those still-incredible effects in 2001: A Space Odyssey. Coincidentally, it took me more than 15 years to finally "understand" 2001. It might take just as long to wrap my brain around The Tree of Life. Because like 2001, The Tree of Life is the kind of movie that you can watch with your eyes, ears and mind wide-open but when you wake up the next morning you're going to forget what exactly it is that you spent all that time paying attention to. I need to watch this again. I'll probably be buying the Blu-ray of it soon. 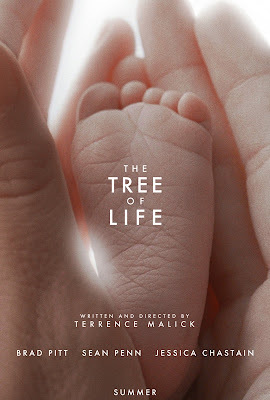 As much as my gray matter felt pulped and spindled after watching The Tree of Life (our host put on Drive afterward and that provided some much needed mental refreshment) I want to say that there was a poignant, haunting beauty in this movie. I would even say that after the events of my own life of late (my mother's passing, coming to terms with bipolar disorder, recovering from a divorce among other things) that watching The Tree of Life was... a healing experience, in ways I can't figure out quite how just yet. I can't think of a cinematic paraphrase of the Book of Job. But that's what The Tree of Life (which quotes from Job at its beginning) is becoming to me. A movie that dares to ask God "Why?"... and gives us His answer. So I'll recommend The Tree of Life to this blog's readers. And I'd be interested to know what others think of it too. I started it, but couldn't finish it. It just bored me to tears, and I consider myself to be a somewhat progressive film watcher. I have good friends who loved it, and I respect that, and the cinematography was pretty great, but I personally wouldn't give the film another minute of my life. But that's just me.